Valentine in Azabu Juban – Life! I love to walk on the Azabu Juban shopping street. Besides being home to my favorite Tokyo bakery, Mount Thabor, and many other fun shops and yummy restaurants, it has art as well. 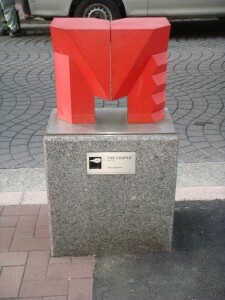 Every block has one or sometimes two sculptures. They are quite small ranging from about 2 ft to 3 ft high most are set on granite blocks like this one. This is the only one with color. I think it is perfect for the lead up to Valentine’s Day.